Close to the church of St Peter’s, this recently refurbished venue is perfect for smaller civil ceremonies, vow renewals or weddings straight from the church. 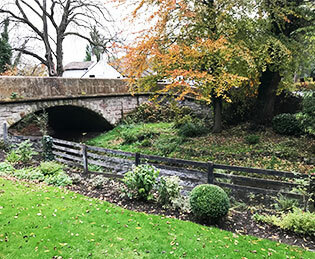 Catering for up to 70 guests, The Bridge is situated on the banks of the River Bollin and the grounds make the perfect setting for family photographs – the actual bridge has been the spot of many a bride and groom posing, smiling for the camera, over the years. The overwhelming picture that this venue paints is that it is a building which has stood the test of time. Once a farmhouse, the low beams and cosy fires in the bar are comforting features from a bygone age. Yet the venue has recently been renovated and boasts striking modern interior design alongside some surprising design twists: the wine cellar, for example, can be seen through the glass floor in the bar. And the upholstery on the opulent chairs is bright and modern: sitting next to tiny leaded windows and surrounded by clocks, globes and wire figurines, the furniture offers a real mix of old and new. The history of the venue goes back to 1626 and it’s great to see that the tradition of serving local produce has not been lost. The menu details the source of the food, much of which is from within Cheshire itself. The chefs, as part of the Flat Cap group of venues, champion sustainable food and have obviously done their best to cut down the menu’s carbon footprint. We enjoyed lunch at the venue and were tempted by the bread as we awaited our main course. Accompanied by an olive oil and balsamic vinegar dip, plus a range of flavoured butters, we nibbled and chatted over a glass of wine, looking out through leaded windows onto the street and hoping to spot a famous footballer or even a well-manicured WAG. Although we failed on our celeb-spotting quest, we were happy to chat to the staff who were extremely well-attentive and knowledgeable about the venue and the food. Our dishes – a confit duck salad with sticky plums and hot sin sauce, and club sandwich which packed in chicken, bacon, salad and a fried egg – were swiftly brought from the kitchen and devoured almost as fast. A newer extension houses some of the Bridge’s 23 rooms, and many have views of the gardens and River Bollin for guests to gaze at during their stay. An accessible room is also available with handrails and a walk-in shower, should a guest require. 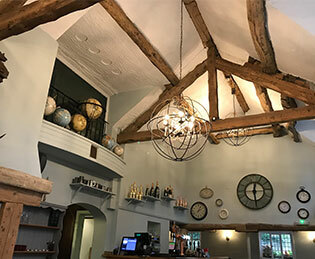 Prestbury is a fine choice for a north west wedding and The Bridge truly makes guests feel welcome with its cosy surroundings and friendly staff. And if, like us, you find the celebrities evade your stay, at least wedding guests will be left feeling like VIPs. There is a choice of rooms in which couples can hold their ceremony: the Whiteside Suite, the restaurant area, the Elizabeth Suite and the Terrace can house your guests for the day and night. Room hire applies to smaller functions so check with the venue regarding prices if you will have fewer than 40 guests. Wedding packages (minimum 40 people) include wedding breakfast, wine, toast drinks, evening buffet, toastmaster, plus complimentary accommodation for the happy couple. The Essential Package is £3,560 for 40 day and evening guests. The Extra Package costs £4,115 for 40 day and evening guests. It includes buffet, flowers and DJ, and 40 chair covers. The Complete Package offers all of the above, plus two-tiered wedding cake and photographer, for £5,020. Extra guests can be added – contact the venue for more details. Visit the website or call 01625 829 326 for more information on The Bridge Prestbury.